Whether you have recently become a fish mum or dad, you have been loosing fish for no apparent reason or are cleaning out your aquarium, you may find yourself needing to use an aquarium water test kit. The quality of your aquarium water cannot be determined by simply viewing the tank. The water chemistry must be tested regularly. 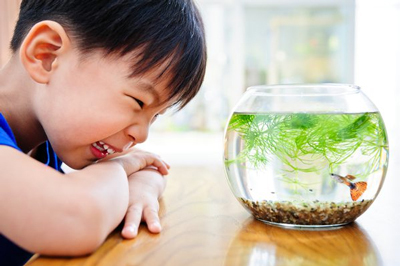 Testing your aquarium water ensures that your fish and plants within the tank thrive and do not become victims of stress, disease or death caused by poor water quality. Aquarium test kits highlight dangers within the water that us humans cannot see with a naked eye. These test kits are the best way to determine the quality of aquarium water. 1 What is an Aquarium Water Test Kit? 1.1 What is Included in an Aquarium Testing Kit? What Water Parameters Should I Test? 2 Why and When Should I Test my Aquarium Water? 3 How Can I Test my Aquarium Water? 4.1.1 When should I Test the pH of my Aquarium? 4.2.1 When should I Test the Ammonia Levels in my Aquarium? 6 What do Different Testing Kits Achieve? What is an Aquarium Water Test Kit? Save the lives of your fish friends; invest in an aquarium water test kit! Aquarium water test kits are designed to measure the chemistry of tank water. Each test kit varies in which water parameter it measures. 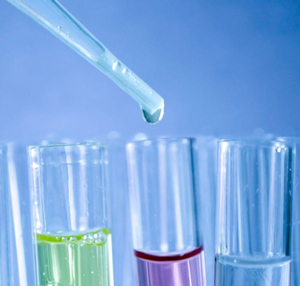 Basic testing kits will handle pH, nitrate, nitrite and ammonia. These kits allow fish owners to identify any imbalances in the water and where appropriate, act quickly to correct them. Successful fish keepers always have a water test kit handy to ensure their fish are living in a suitable environment. If an imbalance occurs in the aquarium water, your fish may fall ill. For instance, if nitrate levels in an aquarium rise too high, the fish are directly impacted and often die as a result. What is Included in an Aquarium Testing Kit? What Water Parameters Should I Test? Test kits are basic although essential. Anyone has the ability to use them. For each water parameter you wish to test, a specific aquarium water test kit will need to be purchased unless the one you buy has multiple solutions. While there are many different water parameters, depending on the type of fish you are keeping will dictate which test kits you will need to purchase. For a beginner, a kit that tests for pH, ammonia, nitrate and nitrite levels is often enough. A testing kit that identifies most water parameters is called a master test kit. These can often be expensive and unnecessary for someone just starting out. Why and When Should I Test my Aquarium Water? The water in your aquarium ultimately dictates whether your fish and plants will live a long life or not. When we fill up a new tank we often use tap water. Tap water is perfect for human consumption although the chemistry of this water often needs to be altered to meet the needs of our aquarium friends. Fish waste and uneaten food left in the tank can create toxic levels of ammonia, nitrate and nitrite which can be detrimental for the fish. Organic compounds found in the tank can also alter the pH level of the water. A fish who is suffering from unsuitable water conditions may have gill or tissue damage, be showing signs of stress or if left to long, may have passed away. Unless you have recently changed the aquarium water, testing once per week is enough to ensure the water chemistry remains stable. If for any reason your fish become stressed, the water becomes murky or you have a fish pass away, you should promptly test the water conditions. How Can I Test my Aquarium Water? Aquarium water can be tested with a basic water chemistry kit also known as an ‘Aquarium Test Kit’. The water parameter you wish to test will dictate which testing kit you should purchase. There are multiple beginner aquarium kits that test a number of factors. If you do not feel up to testing your aquarium water yourself, many pet shops offer water testing for a set fee. This may work out cheaper for you if you are a new fish owner. Fill a cup with water from your aquarium tank. Pour the desired amount of aquarium water from your cup into the test tube (provided in the testing kit). You should never fill your test tube directly from the tank as chemicals may leak into your fish’s environment. Add the desired amount of testing solution to the test tube. The amount you will need to add will be listed in your testing kit instructions. Generally it is three drops or there about. Gently swirl your test tube to ensure the solution has been mixed throughout the aquarium water. Now match the color of the water in your test tube, with a color on the testing chart. Record the result and research if this is normal or abnormal for your aquarium environment. Take the appropriate steps to correct the water parameter. Some other testing kits will only require you to dip a stick and wait for results which is demonstrated in the graphic below. These dip sticks are often more expensive then the droplet aquarium test kits. Solution based aquarium water test kits are often more accurate. If you studied science during your school years you may have basic knowledge of what pH is. pH is a measurement of acidity or alkalinity. 7 is neutral, above 7 is refereed to as alkaline while below 7 is acidic. While the majority of fish can adapt to mild changes in water pH some fish species prefer an alkaline environment while other prefer an acidic environment. Certain live plants or rocks can be placed within a tank to change the pH level if required. Although fish can adapt to small changes in pH over an extended period, rapid changes in pH levels are the leading cause for stress in aquarium fish. If you have purchased your fish from the local pet shop inquire about the pH of the water they have previously been living in and adjust your accordingly. In terms of Betta fish, they are soft water fish and thrive in neutral or slightly acidic waters. In saying this, a pH water level above 7 is still suitable for a Betta as long as it is a stable level; not constantly fluctuating. Highly alkaline water conditions can impact a Betta leading to their fins to curl. When should I Test the pH of my Aquarium? Ammonia is the result of fish excretions, decaying foods or plant waste. Ammonia should be removed from the tank through a filtration system. If for any reason there is a build up of the ammonia in the tank water, it can cause your fish to become stressed. Small water changes can decrease the amount of ammonia build up in the water. In emergency situations, it is vital to move the fish into a stable environment. When should I Test the Ammonia Levels in my Aquarium? While ammonia and nitrites are detrimental to fish, nitrates do not pose as big as a risk. Nitrate is only harmful is mass amounts and can lead to discoloration of aquarium fish. An aquarium that is stocked with live plants can help to keep the nitrate levels at a minimum. Testing nitrite levels once a month is always good along with testing nitrates especially when you plan on breeding fish. KH stands for carbonate hardness. This is how much carbon is in the water at any given time. Aquarium fish enjoy living in environments where the KH is around 80ppm +. If you test your tank water and find that you need to increase the KH, adding a small amount of sodium bicarbonate to the water can do the trick. GH stands for the general hardness of the water. If water is described as ‘hard’ it means it is full of minerals. Most fish can live happily within soft or hard waters as long as there are no spontaneous changes. Consider test kits as part of the operating expense of keeping aquarium fish. Buying bulk aquarium test kits will ensure each test you conduct costs only a couple of cents. 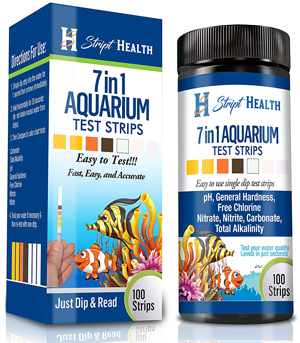 This is one of the most recognized aquarium test kits on the market. With over 800 tests at the low cost of $40.00, it means each test you conduct on your aquarium is really only costing you a couple of cents. This makes for easy aquarium water testing. Depending on whether you have a saltwater or freshwater tank will determine which of the two test kits you will purchase. This testing kit comes complete with a guide on how to correct water imbalances that you may notice after testing different aspects of the water. This is the perfect kit for a beginner fish enthusiast who is keeping fish such as Bettas or Goldfish. Not only is this testing kit one of the most affordable on the market, it also comes with the neat little stand that allows you to keep all your testing equipment in one small compact area. Read more about the API freshwater test kit here, or the API saltwater test kit here. This brand sells one test kit for saltwater and one test kit for freshwater. These test kits are usually sold individually although for the low price of $76.95, six different water parameter tests can be purchased in a bundle deal. 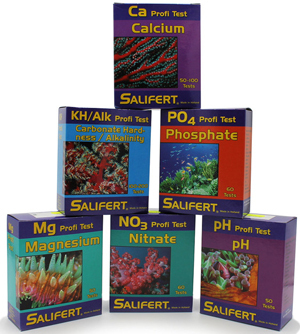 This testing kit is perfect for someone who is operating a saltwater or marine reef tank. This set comes with the majority of tests any aquarium enthusiast would hope to use. These tests have a reputation of giving accurate results fast. If you have a specific water parameter that you wish to test, Salifert have a range of different tests sold separately for around the $10.00 mark each. It is important to choose the correct test for your tank environment; either freshwater or saltwater. This is a strip test that allows a fish owner to test a number of different water parameters at once. This box comes with 100 different strips that each test for seven water parameters. With a money back guarantee, these test strips are great for beginners. Using testing strips means that one strip can do the job of multiple solutions. It is a simple and easy process that anyone can handle. These strips are said to be accurate and are inexpensive. This two pack of monitors are to be stuck to the side of the tank within the water. They give constant water reading about two different parameters; pH and ammonia. For $12.00 the pH test lasts between 3 to 6 months and the ammonia test lasts one year. These allow someone to view the water parameter reading without needing to scoop any water from the tank. This means the tank can be continuously monitored on a day to day basis. What do Different Testing Kits Achieve? Master Test Kits: Often owned by fish enthusiasts that spend a lot of time breeding and growing their aquariums. 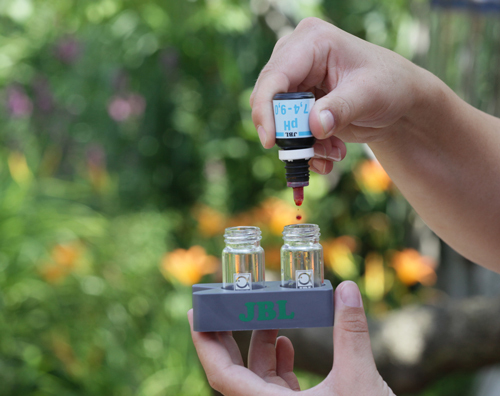 These kits come with multiple solutions to test a large range of water parameters. While these kits are great for those who spend a lot of time breeding fish, the expiration date of each solution often run out at the same time. For a beginner these kits are often not worth the cost. 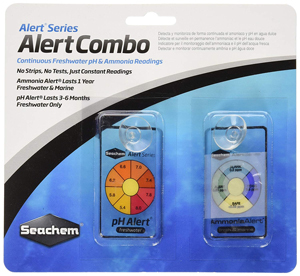 pH Test Kits: pH test kits should be purchased by everyone who owns a fish. Sudden pH changes are invisible to the naked eye although detrimental to fish. Ammonia Test Kits: Even beginner fish owner should have an ammonia test kit on hand. Ammonia levels fluctuate on a weekly basis so it is important to keep on top of levels. Nitrite Test Kits: Another important testing kit for all fish owners. Nitrite levels should be tested when starting a new tank and then monthly there after. Nitrate Test Kits: Nitrate test kits are not as important as nitrite although having one is always handy. High levels of nitrate in a tank will affect your fish over a longer period of time leaving them more open to diseases. Phosphate Test Kits: These tests will usually only be used if there is excessive algae growth. Hardness Test Kits: Hardness tests will either test carbonate hardness or general hardness. These are not as common as other test mentioned above. Fish breeders often have these tests at hand. Before you go rapidly adjusting the water parameter of your aquarium always speak to a trained professional. If you are unsure, taking your tank reading to the local aquarium or pet shop for some advice is always the best idea. Most aquarium stores will sell all the supplies you will need to adjust your tank parameters along with a range of testing kits.